Midlands State University held a High Achievers’ Celebration Dinner on Friday the 30th of November 2018 where all students and clubs that performed exceptionally well during the year were honoured. The special celebration was graced by the University’s Vice-Chancellor Professor Victor Muzvidziwa who was the guest of honour. 2018 without a doubt has been a phenomenal year for the Midlands State University student body and student societies. Under the auspices of the University’s Division of Student Affairs, both students and societies have raised the University flag high through various exploits as they dominated at national, regional and international tournaments and competitions. Addressing students and staff present during the dinner, Professor Muzvidziwa had nothing but words of praise for the high achievers. ‘I am proud to join all of you tonight in celebrating the success stories of the Moot Court students, ENACTUS Club and the Great Debaters who have made this institution proud with their outstanding performances at national, regional and international tournaments this year. ‘We are a pace-setting University hence let us build from the successes we have had this year and keep on cultivating the culture and philosophy of pace-setting here at MSU, at home and also at the various workplaces where you will be after you leave this institution’, said the Vice-Chancellor. He also encouraged students not to be carried away by their achievements but to keep their feet on the ground and work towards achieving more in the future. For the Executive Dean of Students, Mr Isheunesu Chaka, it was an emotional night altogether as it was not only a night of celebrating the monumental success of the clubs but also a night of reflecting on the difficult journey that the Student Affairs Department had gone through with the clubs and societies. ‘For me, it is a very emotional night because it reminds me of the struggles we have gone through from the formation of the clubs up to now. For example, the Debate team which stands today as proud African Champions started with only one girl who dared to dream. ‘ENACTUS which was once not taken seriously when it started has risen to become serial national champions today. As we speak they have won the ENACTUS National Championships twice in a row. ‘The Moot Court students have also dominated resoundingly on the national, continental and international fronts. 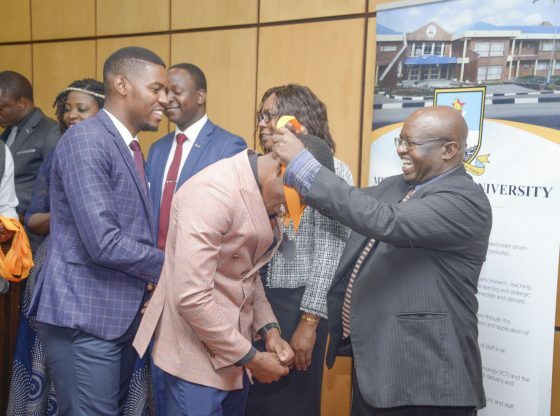 They won the African Championships that were held in Arusha, Tanzania and were also crowned champions in the United Nations moot court competitions Heads of Argument in Switzerland,’ he said. Mr Chaka ended by congratulating the clubs and societies for years of hard work and he assured them that they would keep on reaping the fruits of their labour. Representing the clubs and societies patrons, Mr Tawanda Chibanda (Great Debaters Patron) thanked the University community for the support rendered to the competitors by the institution and also commended the students for their hard work. ‘I would like to thank the University administration for the overwhelming support they rendered to the clubs and societies. It would have been impossible to perform and achieve highly without their unparalleled support,’ he said. The students themselves had nothing but words of praise for the wonderful support they received from the University. Speaking on behalf of the clubs and societies Dino Ndhlovu acknowledged the role played by the University in facilitating their success stories. ‘We are national, regional and international champions because of the wonderful support we received from this great institution. We want to thank the Midlands State University for supporting us in ways we never thought possible and we would want to reassure the University of First Choice that we will keep raising the flag of this great institution high’. The dinner was organised by the Acting Pro Vice-Chancellor, Research and Academic Affairs Professor Doreen Moyo together with the Division of Student Affairs as a way of recognising the students for their unmatched brilliance and fantastic performances in the calendar year of 2018.